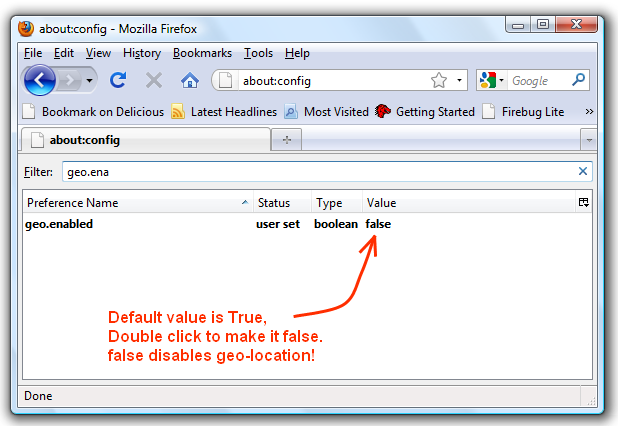 How to permanantly disable Geo-Location or location-aware browsing in Mozilla Firefox? Firefox versions 3.5 onwards supports location-aware browsing. Websites that use location-aware browsing will ask where you are via the browser in order to bring you more relevant information for eg. you are looking for a pizza restaurant in your area. A website will be able to ask you to share your location so that simply searching for “pizza” will bring you the answers you need... no further information or extra typing required. Although you can temporarily disable this by clicking on deny, but next time you visit a location-aware website, you will see this tooltip again. In this article we will tell you how to permanently get rid of this share-location permission prompt in Mozilla firefox browser. To disable the geo-location option permanently all you need to do is just goto the address bar and type about:config. This will take you to the Configurations menu editor. Now click on the I'll be careful I promise button.